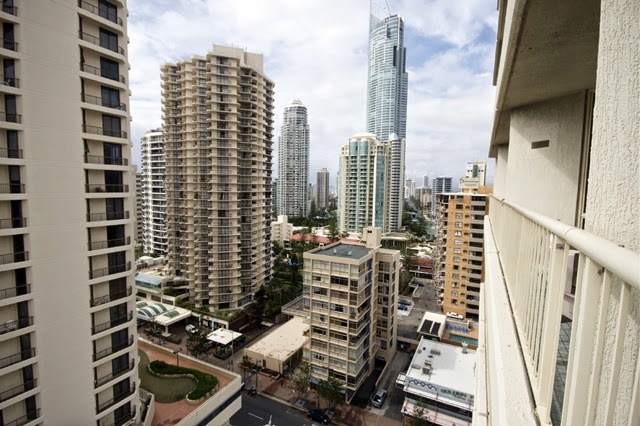 Just as Brisbane's skyline has changed over the last few decades, so has that of Queensland's second-most populous city, Gold Coast. In Surfers Paradise particularly, high-rise towers have sprouted like beanstalks to cast their long shadows across the famous beach in the late afternoon. It was a Melbourne-based Jewish refugee from Europe who was in the vanguard of the change from the fibro beach shack village to a multi-storey metropolis. Stanley Korman arrived in Australia in 1927, an ambitious 23 year-old who rose from early employment as a cleaner to be one of Australia's leading entrepreneurs. After making a fortune in clothing manufacture his company acquired brands such as Rockmans, Roger David and Holeproof. Not satisfied with this success, Korman moved into property development. Visits to Miami in the USA provided a blueprint for canal development leading to the creation of Chevron Island and Paradise Island on the Gold Coast. 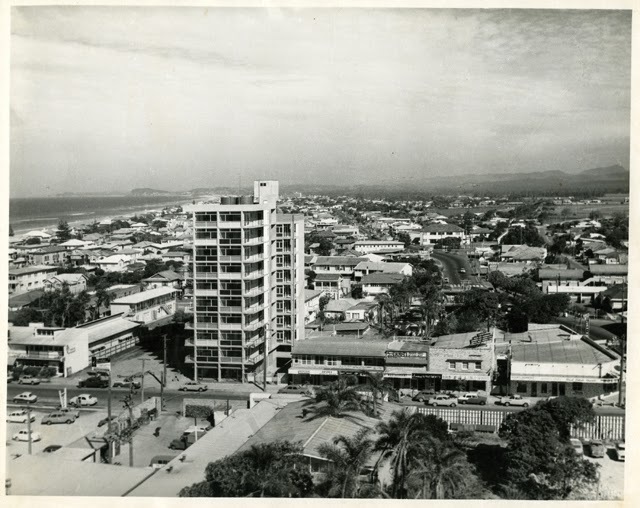 Korman developed the first high-rise apartment block in Surfers Paradise in 1959-60 after having completed the Chevron Hotel and Lennon's Hotel (both now demolished) in the area. 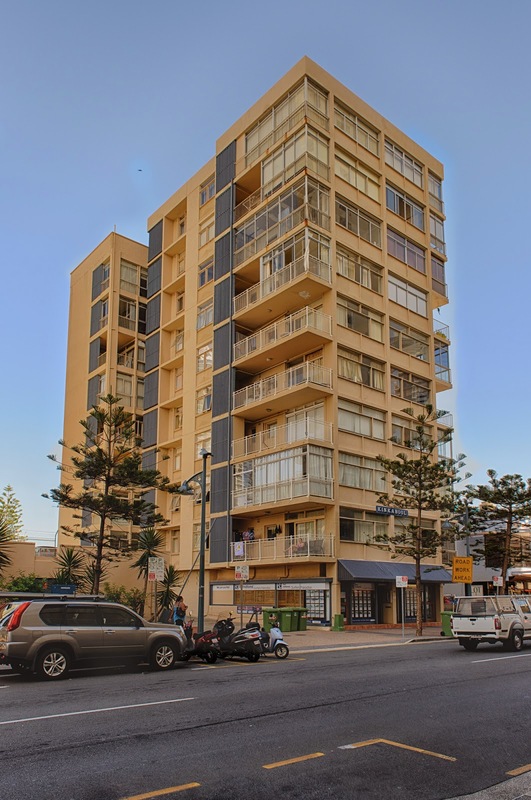 Kinkabool is a ten-storey building that stands right in the middle of Surfers Paradise and is now listed on the state's heritage register. Here is a photograph of the Surfers Paradise skyline shortly after the completion of Kinkabool. Its 34 units ranged in price from £3,000 to £5,000. Korman's belief that tourism would be driven by such high-rise residential accommodation was proven correct. Soon other towers like Iluka joined Kinkabool to attract holiday makers to the Gold Coast. Here is an aerial view taken in the early 1970s when new unit blocks were emerging. Kinkabool is the white building right of centre; and the first of the absolute beachfront unit blocks, Iluka, is on the left of picture. Nothing remains constant in property development terms - Iluka has now been demolished, soon to be replaced by something bigger and shinier. Here is a current picture of Kinkabool. And compare the current Surfers Paradise landscape with the earlier photographs. Kinkabool (bottom, centre) is surrounded by massive structures that now dominate the skyline. But what of Stanley Korman, the original high-rise entrepreneur of Surfers Paradise? The credit squeeze of the early 1960s saw investors in his company lose tens of millions, resulting in charges against Korman for issuing a false prospectus. He was jailed for four and a half months and upon his release he moved to the US to start again in property development, building office blocks, supermarkets and a hotel. He died there in 1988 and his body was brought back to Melbourne for burial.